How Far is Starlite Pavilion? Starlite Pavilion is an enclave of meticulous apartments in the heart of Bala Nagar, Hyderabad. It is boasted with all the modern day amenities, required for a contemporary lifestyle. It is home to those who wish to seek a contemporary lifestyle and modish house which meets their daily needs and matches their preferences. 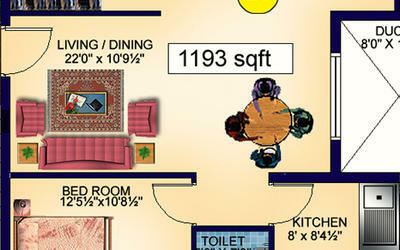 It ensures you a comfortable and elegant lifestyle, keeping in mind the needs of the residents. 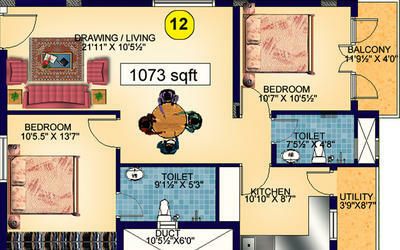 The project offers you lavishly designed 2BHK apartments for sale in a size dimension of 1073 - 1193 sq. 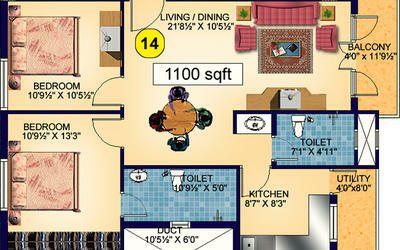 ft. as well as well - planned 3BHK apartments for sale in Hyderabad with a size range of 1476 - 1688 sq. ft. with added features and fittings. It is comprised of top-notch facilities and equipment. Each and every apartment is designed with sheer hard work and unique designs that are of a great value and unmatched quality. This project has made it very convenient for the home seekers to experience the modern comforts and elegant houses at affordable prices. This abode of magnificent apartments provide you with the best living experience, it is a kind of residential space that will leave you with happy moments to cherish for the rest of your life. Black Granite Platform with 2 Feet Ceramic tiles Dado along with Single Bowl Stainless Steel Sink & Drain Board. Ceramic Floor and Wall Tiles upto Ceiling Level. Granite Wash Basin Counters with premium Sanitary and CP Fittings. POP Design Border in all Bedrooms,Living and Dining Areas. Fall Ceiling to be done in all Bathrooms. Starlite Spintech Limited is a Private Limited Company. It was incorporated in the year 1995 for the purpose of Textile Exports. The group entered into real estate industry in the year 2005. They are well known for their magnificent designs, unmatched quality, and timely delivery. They strive to fulfill the needs of the customers and also provide them with excellent living spaces. Their projects are comprised of Starlite Star Homes in Bala Nagar, which offers you lavish 4BHK villas for sale and also Starlite Pavilion in Bala Nagar which offers you 2BHK & 3BHK apartments for sale in Hyderabad. Star Homes has come up with projects that are unparalleled. They invest in commercial projects and residential townships, which are constructed under this reliable name.